>> If you have already completed the registration process or wish to return to a registration which you've started but not completed, you can log in and update your profile. 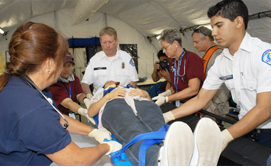 By registering on the California Emergency Medical Services Authority's (EMSA) Disaster Healthcare Volunteers Site for health professional volunteers, I agree to be considered for service as a volunteer health professional during a duly declared emergency or disaster. As part of the registration process, I agree to voluntarily provide personal information that will be collected, used and maintained by EMSA in implementing the Disaster Healthcare Volunteers System. I understand that the information I provide will be used by EMSA to determine the status of my credential(s), including confirming that my license is current, valid, and free of any restrictions. By registering and agreeing to these Terms of Service, I agree to have the status of my credential(s) verified by federal or California licensing/credentialing authorities. I also understand that the information I provide will be used by EMSA to assign me an emergency credentialing level in accord with applicable emergency credentialing standards. I understand that the assignment of an emergency credentialing level neither designates clinical privileges nor authorizes me to provide health services without proper authorization and supervision. 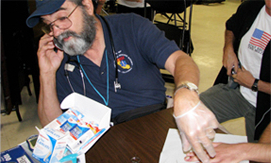 I further understand that, during an emergency or disaster, the information I provide will be used by authorized Disaster Healthcare Volunteers Site administrators and local (county) emergency/disaster managers to assign me to activities for which I am adequately credentialed and by on-site emergency/disaster operational area officials to identify me once I am deployed to the emergency/disaster locale. I understand that if I am a member of a Medical Reserve Corp, the information I provide may be used by the MRC for assignment and deployment purposes. I understand that, if I agree to deploy to a specific emergency/disaster, the information I provide to this Site will be forwarded to operational area officials, and that EMSA can provide no assurances regarding the security and privacy of that information once forwarded to the emergency/disaster operational area. I also acknowledge that the information I submit may be subject to disclosure pursuant to a request under the California Public Records Act (Government Code sections 6250, et seq.) or legal process, such as a court order or subpoena. Disclosure of highly sensitive personal information will only be done in accordance with the California Information Practices Act (Civil Code 1798.24), and any other relevant state or federal laws. I hereby voluntarily consent to the collection, use, and maintenance of my personal information as described herein. I understand that the process of being selected for service as a professional health volunteer for a specific emergency/disaster is a process in which the information I enter at this Site will be evaluated to match mission requirements. I understand that, if selected, I will be contacted by Disaster Healthcare Volunteers Site administrators and/or local (county) emergency/disaster managers, and I will then be given the choice of whether or not I wish to volunteer my services for that specific emergency/disaster. I understand that if I volunteer for service for a specific emergency/disaster, my personal information will be forwarded to the requesting agency in the emergency/disaster operational area. I understand and agree that registering at this Site provides no guarantee or assurance that I will be requested for a specific mission or emergency/disaster deployment. Similarly, I understand and agree that registering at this Site in no way obligates me to participate or deploy for a specific emergency/disaster and that I may decline to participate or deploy for whatever reason I choose. I acknowledge that by registering at this Site I am representing that I am of sound physical and mental capacity, and capable of performing in an emergency/disaster setting. I acknowledge that emergency/disaster settings can pose significant psychological and physical hardships and risks to those volunteering their services and that emergency/disaster settings often lack the normal amenities of daily life and accommodations for persons with disabilities. In agreeing to volunteer my services, I agree to accept such conditions and risks voluntarily. By registering at this Site, I agree to participate as a volunteer, without compensation or payment for my services. I agree to hold EMSA and the State of California and any of its entities or subdivisions harmless from any claims of civil liability, including but not limited to claims of malpractice or negligence, injury, or death. By registering and using this site, I am accepting the current Terms of Service. I understand that this registration site is a non-commercial venue which will assist in emergency response services. I agree to not copy, sell, or exploit any portion of this Site for any commercial purpose. By registering and agreeing to these Terms of Service, I agree that the information I provide and the representations I make at this Site will be truthful, complete, accurate, and free of any attempt to mislead. I understand that I may return to this Site and modify my personal information at any time, and I agree to keep such information updated and current. I agree to protect the confidentiality of the password I have chosen that provides access to my information on this Site, and I agree to abide by all security provisions of this Site.